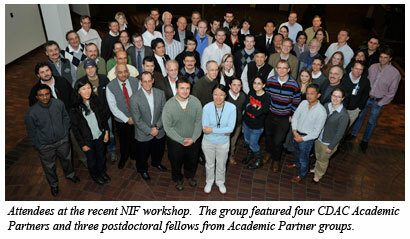 On Friday, December 17th, a workshop entitled "Exploring Giant Planets on NIF: A New Generation of Condensed Matter Science" was held at Livermore National Laboratory. Attended by scientists from around the country and hosted by CDAC Academic Partner Raymond Jeanloz and Steering Committee member G. W. (Rip) Collins, the workshop was convened to explore the many different fundamental science challenges that the extreme conditions research community may address with the capabilities of the National Ignition Facility (NIF). NIF houses the world's largest and most powerful laser, capable of reaching temperatures of 1 million Kelvin pressures of 100 Mbar in condensed matter. It is predicted that the experiments now possible with the capabilities of NIF will allow the most fundamental insights possible into the very nature of condensed matter, in addition providing the energy to access completely new states of matter at extreme conditions. NIF is allowing approximately 15% of its time to be used by the academic community for pioneering experiments in this area of extreme conditions research. After an introduction to NIF and its capabilities and the progress of its construction by NIF Director Ed Moses and National Ignition Campaign Director Jeff Atherton, a series of three scientific sessions each featured several short presentations by leaders in the field that focused on unsolved problems in the areas of Hydrogen and Helium, Materials Science and Chemistry. The session on Hydrogen and Helium was chaired by CDAC Director Russell Hemley, the Materials Science session by Advisory Committee member Yogendra Gupta, and the Chemsitry session by Richard Martin from the University of Illinois. For more on the National Ignition Facility, see https://lasers.llnl.gov.